A lot of move premiers and TV show episodes have been cancelled in the last couple of days after the incident in Newtown, CN. TLC has announced that it is postponing the premiere of a special called Best Funeral Ever from its original air date to December 27 to January 6. OK, first of all - it is supposed to follow the Here Comes Honey Boo Boo Halloween Special (yes, that is correct - their Halloween special is airing the week of Christmas)...how is that and MORE offensive than Honey Boo Boo? Second, postponing the airing for one week is not really that big a deal. 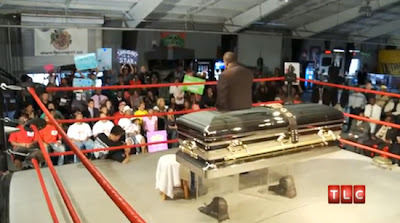 Third...why the hell did TLC create a show that focuses on themed funerals? Can someone please go over to the TLC headquarters and punch someone in the box? It seems like it is needed.